This thread is to discuss the different Woofers used in the Large Advent. The good news is that it seems they got it right from the start and did not make many revisions. I've worked on about 6 Masonite type Large Advent woofers and have seen many more on ebay. They all looked the same, cone, dust cap, edge, voice coil, spider, etc. I also have to mention that they seem to have poor build quality. Glue is often dripped on the spider, and often not very well distributed along the spider to voice coil joint. One woofer only had glue about 1/3 of the way around and was nearly coming loose. I suggest people inspect the glue joints when rebuilding them. In contrast the later New Large Advent woofers seem to have very good build quality. And the parameters that I've measured have been fairly consistent indicating that they did put in controls to keep cone mass and other parameters tight. It has often been mentioned that the New all metal woofer and the early masonite type have the same T&S parameters, and I have confirmed this. The New will even mount into the earlier cabinet, it was designed this way, but not the other way around. 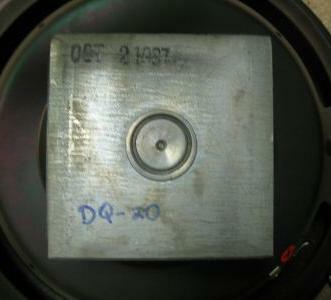 At a glance most of the parts look identical, however on closer inspection the dust cap while of the same material and shape is larger on the New Advent woofer. Two inches on the original woofer, and 2.25" on the New Advent woofer. This is the actual dome not including the glue lip. I noticed that samples of the New tended to have a lower DC resistance than the original and on closer inspection, noticed that the flexible wires from the terminal strip to the cone are much thinner on the original woofer. I've never seen one break, but this did seem to account for the difference. I've noted in the past that the voice coil former is shorter by about the amount that the cone is set back in the New woofer but otherwise the motor design is the same based on what can be seen from outside dimensions. The differences noted are very minor. I do like the better heat sinking of the longer voice coil in the original woofer but it is also a minor point especially if you do not push a system hard. Thanks for documenting this information Pete. It is always good to have as much as possible out here for reference. Also for your electrical measurement info. in your other posts. I agree with all of your observations, having found the same likenesses/differences between the masonites and all-metal versions. I have never seen one of the "improved" frame masonites like the right one in your one picture. I wonder if is an early one or late? I don't suppose there is any date indication on it? Great information write-up as usual, thank you. The date is stamped on the magnet in purple ink as with most, however it is so blurred that all I can read is SEP. It's mate from e-bay shown in the picture is Nov 7, 1972, but are they actually a pair being of different construction, or was one a replacement? Who knows? Thanks Vern, all the best to you! I find that it is possible to drive the masonite type woofer to full excursion at the resonant frequency of about 16 Hz in free air. Driving a properly refoamed driver within Xmax provides smooth noise free operation within Xmax, then when driven harder the harmonics can be heard which is normal. Gently bringing up the level, the voice coil can be heard just tapping the back plate. 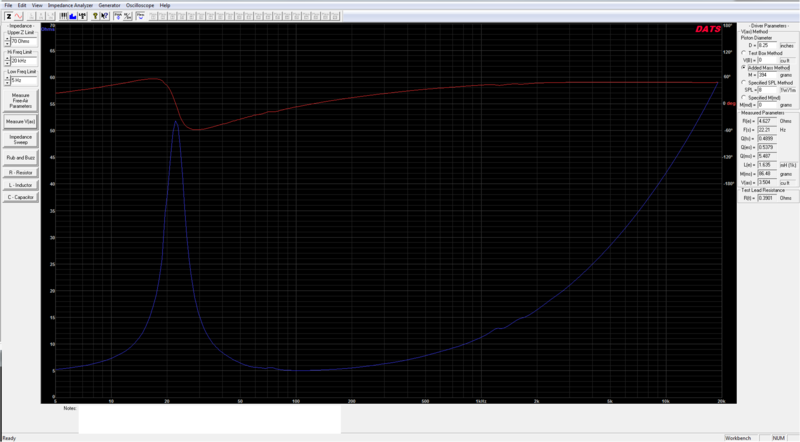 I find that 7 volts input at 16 Hz does not tap, and by about 8 volts there is some gentle tapping with most drivers. I have one woofer that was damaged in shipping, the other in the pair shifted in the box and damaged the cone. I refoamed this one anyway, and the T&S parameters were fine, however it is easy to hear the voice coil scrape badly with any significant excursion. It can also be heard in system with bass heavy music. I'm a fairly cautious person and have been lucky over the years not to have had any accidents testing drivers, knock on wood. However, at 3 AM I get a little tired and hit a key on my system, what key I don't know, that sent the signal generator to full output. I use a Hafler 500 (250W/ch) amp for testing, I don't think it was putting out more than 10 or 12 Volts, but it was enough for the poor Advent woofer to pound the back plate like a jack hammer, LOL! Intersting that in the seconds it took me to hit the power switch it just kept on going without the tone changing or anything really bad happening. It was loud! The driver was fine, no scrape, no buzz, sounds fine in system, not generally recommended but shows what a robust driver it is. Luckily, this was a spare woofer not going into any important system. 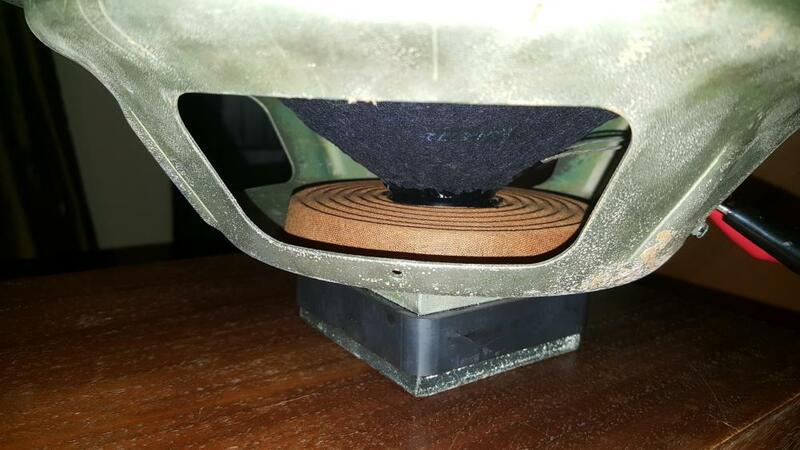 Several of the masonite woofers have wood that is difficult to move even a 1/64 of an inch, others seem to easily move 1/32 or even 1/16 of an inch. I've often thought that the spider should provide much of the restoring force and therefore the very compliant edge should not move the cone much if the wood is flexed. This is not the case, flex the wood and the cone seems to move nearly the same amount. The spider provides very little restoring force in these woofers. I have also noticed that some of the masonite wood is slightly warped about 1/32 of an inch forward. I removed the masonite on the woofer that was damaged in shipping and it was not glued down very well. This was one that flexed fairly easily. Regluing with a stiff glue might help. 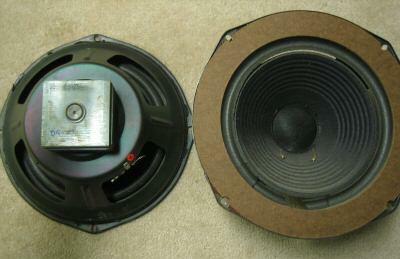 I also removed the cone and voice coil on the 1974 masonite woofer that was damaged in shipping. It looks more or less identical, however only 2 turns are left off the top layer. Is the 4 versus 2 turns left off a refinement to the original design, did they find that 2 made for a more linear motor? Or was it just a manufacturing variation? The 1972 woofer has a DC resistance of 4.53 ohms, and the 1974 is 4.64 ohms. Small difference however it might be due to the two extra turns on the 1974 woofer. I have also noticed that the amount of copper voice coil showing between the top of the spider and the back of the cone does not seem to be very consistent. I estimate that it varies from 3/8" to 5/8" and when I compare the 1972 to the 1974 there is about 1/8 inch difference in the distance from the top of the windings to the back of the cone. Is this just sloppy construction, or did they use a jig that makes the important distance from the top of the cone (where the foam edge attaches) to the voice coil windings the same? I measured this as best as I could with a vernier and the two that were different by 1/8" were nearly the same measuring this critical distance, I'd say they were within 1/64". So it does seem that they compensated for differences in manufactured cone height, and this is good. 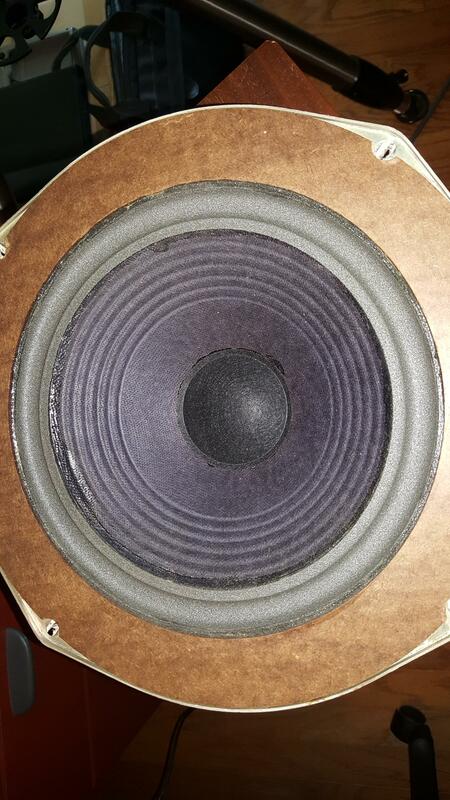 The dust caps on both the masonite, and New woofers are somewhat porous. They provide a slow leak in the system. The dust cap while of the same material and shape is larger on the New Advent woofer. Two inches on the original woofer, and 2.25" on the New Advent woofer. This is the actual dome not including the glue lip. Hi Pete. More great information! I was working on one of my Heathkit amps recently and had an all-metal Advent hooked up to one of the channels. I was "injection testing" (using a screwdriver and touching it while inserting into the RCA inputs) to get hum out of the amp. I meant to turn the balance control and rapidly turned up the volume instead (wasn't watching what I was doing) and "brrrrraaaaaatttttt" went the woofer with the VC hitting the rear plate very hard. It still appears to be just fine! Looking at the 1972 and 1974 masonite type woofers I've determined that the center pole is a T shape type which also improves symmetry in the motor. I was under the impression that all 5002/5012 Large Advents were by Jensen, and would therefore have the round magnet. Searching on ebay seems to show that the 5002/5012 was first made by Advent with the New Advent square magnet woofer. These state on the back plate something like Made by Advent, Cambridge, MA. I don't know when Jensen took over, and they probably used up the old stock of woofers before making the slightly different round magnet version. This is pure speculation on my part, but it makes sense. There seems to be an answer on, guess where... eBay, to the question above about the woofer with the extra ribbing on it and whether it is an earlier or later variation. There is a current auction for two of them and the date stamped on them is from 1970. The two also have a round "bump" on the rear of the magnets too so I guess that's a third variation. I happened to see those also. It seems that they were just tuning the design early on. Kloss designed them in 69, so that was fairly early. I believe that the change was for cost reduction and to take advantage of adhesives, the bump looks to be part of the pole piece that was probably press fit into the back plate. The later versions probably just have the pole piece glued on. 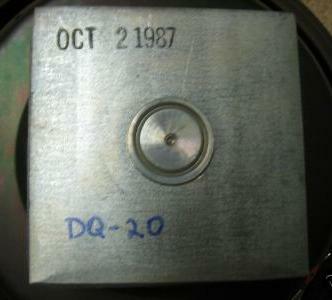 I saw something even more out there 1987 Dahlquist DQ20 woofers that are masonite type, with the pressed pole piece. Let me find the pictures. The wind height = 5/8"
weighed the above cone/voice coil assembly on a scale and it is 34.9 grams. Xmech = .62" or 15.8 mm. Xmech .62"/ linear Xmax .13" = 4.8 or expressed in dB: 13.6 dB. outstanding woofer, when in reality it is the large mechanical limit and headroom. the AR-11 woofer that I examined. I have stated for a long time that pushing the damping material up against the back of the driver lowers the system Q, and this is a clear demonstration. Keep in mind that a Qtc of .707 is - 3dB at Fc, whereas a Qtc of 1.0 is 0 dB down, 3 dB is a large difference. Also note that Fc is correct as designed being in the low 40s. I purchased a pair of Large 5002 Advents by Jensen with the round magnet woofers some time ago. These look from the front like the New Large Advent (NLA) woofers, with the only difference being that the dust cap looks to be made of paper. These have a bumped back plate and the motor geometry appears different based on the outside dimensions, however, it could be roughly preserved if the voice coil dimensions were also adjusted. I cannot be sure until I find a failed driver that I can take apart for analysis. Testing these 5002 woofers in the same way at 16 Hz I'm finding that they will take more voltage, about 8.5 Volts, before hearing significant harmonics. I've brought the level up to 14.5 Volts and they are still not bottoming ... Impressive! Don't want to go any higher for fear of damaging this woofer. The movement is impressive! Looks like 1" peak to peak! Perhaps I'll do some distortion tests at some point which is the correct way to explore the nonlinear behavior of these drivers. I would replace the foam with fiberglass to provide a lower Fc. Bump - All about LA woofers. I have measured one of two Advent Masonite woofers with DATS 2. This particular woofer (woofer #1) appears to be original except for a new surround. I'm not sure if the correct surround was used and have new surrounds coming from Rick. The Fs appears to be a bit high, but it still simulates well given the high Fs. My measured Vas appears to be inconsistent with other Vas measurements on the Advent woofer(s) posted here. I know the DATS 2 is accurate and my weight for the Vas (Added Mass Method) is accurate. The other Advent Masonite woofer (woofer #2) I have may be a total recone from the physical looks of it. It closely resembles a "real" Masonite woofer. However, it may be another derivation of the Advent Masonite woofer.